A tweet from Blowout Cards this morning informed me of the the best card from Razor was pulled and thrown up on the Bay. This is definitely a beautiful card. The eBay auction has a asking price of $8,000 right now. And, should I buy it for the BIN price, I would make $160 in eBay bucks. Great deal! When a card like is pulled from a set, does it stop collectors from buying that set anymore? I haven't bought any Razor or thought about purchasing any Razor, so any feedback is appreciated. I don't think so because there is a ton of other great cards in that product. I haven't bought any either but a friend of mine has and they are very nice. I call what you describe, the Willy Wonka effect. uhh, I never did buy a product with hopes of receiving a cut auto. Never even crossed my mind. What are these "ebay bucks" you speak of? and that is the single sharpest cut sig I have seen from Razor yet. It also beats out the vast majority of topps and UD offerings. Doesn't anyone like photos on their cards anymore? exactly what i was thinking night owl. With the questioning of the Razor Oval Office sigs, I wonder if Razor did a much better job vetting Sports Icons cut sigs or if there is question about SI sigs, too. Whatever the Ruth might eventually sell for might answer that question. 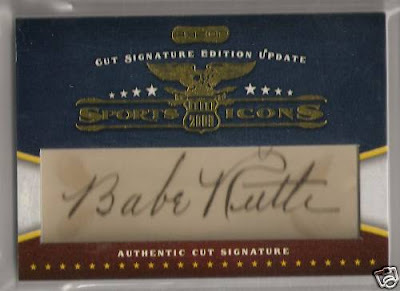 Made poorer for the lack of photo, for sure, but that is a nice looking Babe Ruth signature.